Home Whatsapp Send Blank Messages On Whatsapp (Step By Step). Send Blank Messages On Whatsapp (Step By Step). Hey Friends wassup...!! Today I'm gonna tell you a step by step guide one how to send blank messages on whatsapp. As we all know whatsapp is the greatest app to send personal messages freely. Whatsapp keeps updating its features time to time and we all keep waiting for these updates. We all use whatsapp to chat with our friends, family or known ones. Most of people spent their full day in talking on whatsapp. Sometimes we don't have words while chatting with friends specially in the case of gf or bf lol. That is really awkward moment when we don't have words for chat. Don't you think if we have a option to send blank message then it will be awesome for that awkward moment but unfortunately whatsapp don't have such feature to send blank message, then we feel the need of this trick how to send blank message on whatsapp. 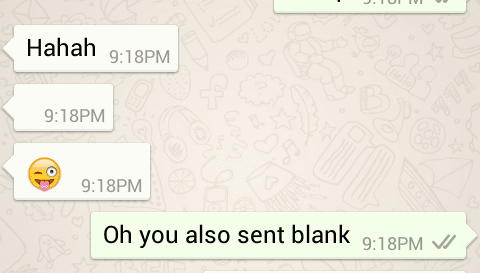 Generally we have three methods to send blank messages on whatsapp. So let's directly come to the point how to send blank message on whatsapp..
You may also like "How to hide whatsapp images and media from phone gallery". You may also like "How to disable blue ticks on whatsapp"
In this method we will use "Noword" app. 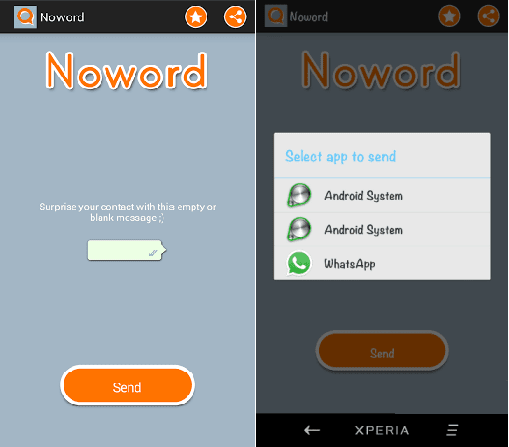 This Noword app allows us to send blank messages on whatspp freely. You can download this app from google play store or your any app store. This Noword app contains an option to send blank message on whatsapp so that we just have to tap one button and that's all. Step 1 :- First of all download and install "Noword" app ( you can directly download this app from above given link ). Step 2 :- Now launch this app and then just click on 'Send' button over there. You may also like "How to get unlimited Facebook like in just 5 minutes". Step 3 :- Now you will your installed messengers, just click on whatsapp and then just choose the person or group on which you wanna send blank message. That's all... now you can successfully send blank messages on whatsapp with Noword app. In this method we'll use some letters specially Arabic letters to send blank message on whatsapp. There are some Arabic letters which whatsapp is not able to read so it converts this Arabic letter into a blank word. 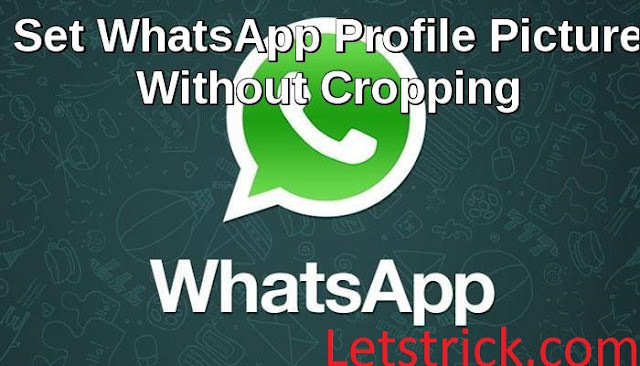 You may also like "How to set whatsapp profile picture without croping". The Unicide of that Arabic letter is "0xFDFF". Check more about this Unicode here. You should download this Arabic letter file. In this method we'll need help of computer once to send blank messages on whatsapp. Step 1 :- First of all open Notepad and type "Alt+255" or "Alt+0160" (Actually this will gonna create a blank space in Notepad which will help us to send blank messages). Step 2 :- Now just save this Notepad file and then send this file on you Android or iphone ( simply copy paste). You may also like "How to recover deleted whatsapp messages". You may also like "How to lock and unlock pc with a usb drive". Step 3 :- Now just open that file on your phone and then you will see blank space, copy that blank space and paste it on whatsapp message bar and then just tap on 'Send' button. Download Muzhiwan APK Latest Version for Android - All games are available for download for free and tested licenses for Google Play. Now you have successfully learned how to send blank message in whatsapp without any software.. 😀check more here. It is really good. I hope you will continue for sharing such a excellent post. This was truly extremely enlightening site for me.